Earth friendly continues to be a buzzword frequently uttered within the construction industry. What exactly are earth friendly materials, and why do they even matter? At Mike Sikora’s Dayton Home Improvement, they strive to provide you with the materials that can better work with your needs while still being the best for the environment. 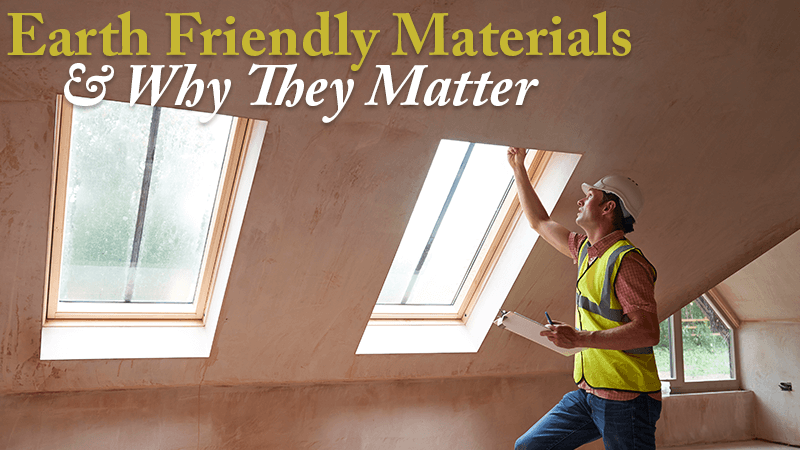 What are Earth Friendly Materials? There is no hard and fast definition when it comes to earth friendly materials. In some instances, construction materials are made from recycled elements that reduce the amount of new materials that must be used. In other cases, these materials might help a homeowner save money on their construction costs or utility bills throughout the lifetime of their home. Mike Sikora’s Dayton Home Improvement uses siding for a number of different reasons. In addition to its superior insulation ability, siding costs less to manufacture and requires only a small amount of energy to make so that it uses fewer of the earth’s resources. This building material is also lighter when compared to some other types of building materials, making it less expensive to transport from the plant to the warehouse and then to the job site. Vinyl siding is one of the most common materials used on homes today and is almost always used on those homes that are built to be sustainable. By using colored shingles that are designed to reflect the sun, Mike Sikora’s Dayton Home Improvement can increase the energy efficiency of each home they work on. Because the shingles are colored, homeowners can have a roof that suits their decorative desires without compromising energy efficiency. So much of being earth friendly is wrapped up in reducing the amount of energy that is consumed. A homeowner can significantly reduce the amount of energy use that is generated by their home by choosing new windows. Dayton Home Improvement – Mike Sikora uses only windows that are designed to save the homeowner money in energy costs. Each window is made of two panes of glass with an air space in between. This helps keep the home cooler in the summer and warmer in the winter by reducing drafts and the loss of hot and cool air. With today’s earth friendly materials, a homeowner can improve the look of their home while also increasing its energy efficiency. Contact Mike Sikora’s Dayton Home Improvement today to learn how they can help.